Projects are selected on their value to the community as a whole, on their sustainability and on the prospects for a successful completion. PAT members may submit major projects for consideration to the BOD or request help with minor projects in their own neighborhoods. Depending on the costs involved, funding may be sought from State or Federal Agencies. As an alternative, PAT may choose to donate funds to other organizations involved in a compatible project. In addition to a walking trail currently in place, 15 members of PAT worked 3 hours on trail work day 2013 to open up a multi use trail for horseback riding, bicycling and hiking. The land is under conservation and managed by the New Boston Conservation Commission. Additional work is scheduled for 2014 to mark and widen the trail. 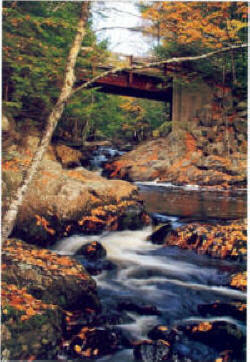 The trail offers beautiful, scenic views of the Great Meadow, New Boston`s wild life jewel. Ducks, geese, beaver, moose and bear also enjoy the Great Meadow. This trail is a link between Francestown (Kingsbury Hill), Weare and several of New Boston`s prime trail areas. The Sherburne Forest Trail is an extension of the New Boston Trail on Old Coach Road. This trail system encompasses three town forests; Lydia Dodge Forest, O`Rourke Forest and the Sherburne Forest. Boy Scout Troop #123 partially cleared the Sherburne Forest Trail in 2013. A bridge was built by a Scout going for his Eagle Scout Badge. This year, PAT will be completing the trail clearing and marking the trail. This trail is a multi use trail, with a section linking to Janet Nixon`s trails along the Piscataquog River. PAT actively supported efforts to fund the additional $25,000 necessary to complete the repairs on High Bridge after the Lyndeborough Trails Association was awarded a $25,000 grant from the NH Bureau of Trails towards the restoration of the bridge. High Bridge is open for multiuse by hikers, bicyclists, horse back riders, cross country skiers and snowshoers. Many more trails and gravel roads are now accessible in Lyndeborough, Francestown and New Boston. PAT, along with other organizations and members of adjoining communities has contributed to purchasing the development rights at Kingsbury Hill Farm, preserving it forever. Landowner Janet Nixon allows access to her property for recreational activities including hiking, horseback riding, cross country skiing and snowshoeing. PAT members participated in a general cleanup of the New Boston 4-H Grounds. This facility is a great asset to the area. On old wooden bridge built by Ken Marvell on the Martin Conservation Easement on McCollum Road was broken and overlaid with fallen pine trees. In two stages, members moved the heavy hemlock boards deep into the woods to the site; then at a later date, members sawed and removed the trees and rotten planks from the supporting timbers. The timbers were in great shape! The boards were placed on the timbers, holes drilled for the huge nails, and the crew drove the nails through the boards into the timbers. It was quite a workout, but many hands made the task easier. The bridge looks like it has always been there! Mission accomplished and a happy landowner as well. Bob Beausoleil was the project manager for this task. Well done, Bob and crew! PAT donated money to Francestown Land Conservation, Inc. (FLC) towards the purchase of the Normandin Forest. This land is in the proposed Rose Mountain Greenway (located in Francestown, Lyndeborough and Greenfield) that FLC is working to protect. The land is bordered by Russell Station Road (a gravel road), Driscoll Hill Road (a wood road leading northward to the Rand Brook Forest), the beautiful French Road (leading to the Rose Mountain trail and Mountain Road in Lyndeborough) and Old Greenfield Road (also leading to Mountain Road). We support the efforts of FLC to protect this area as open space for wildlife and recreation. Equestrians and hikers have been enjoying these old highways for years. Unfortunately, however, the Rose Mountain trail has been abused by motorized vehicles and is completely eroded. It is not suitable for equestrian use at this time.